The other day I had the perk of being treated to a really great skincare treatment. You see, I went to a birthday party this summer and found myself talking to a new acquaintance, a woman with the most glowing and beautiful skin. 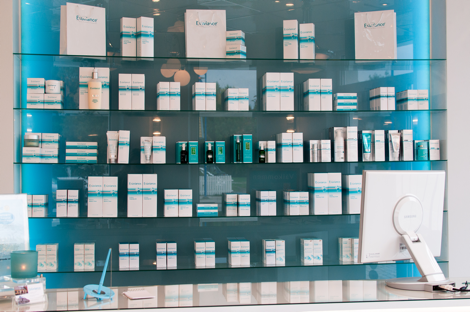 It didn´t take long before we were talking all about skincare regimens. It turns out that her gorgeous skin was a) a result of good DNA b) she´s the business developer manager at medical skincare brand Exuviance and uses only their products. 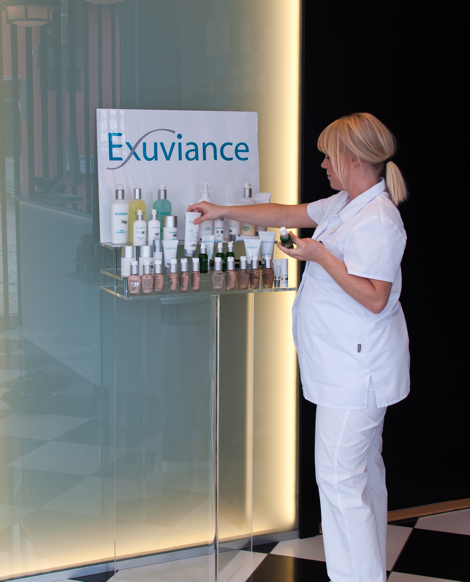 So she kindly offered me to try out a facial at one of their Exuviance clinics for Inner Outer Beauty. Exuviance skincare products and facials are based on aha acids. Since I suddenly got hormonal acne in my twenties, and absolutely nothing cured it, I as last resort decided to try out aha treatments. Back then, aha was fairly new to the beauty industry and not many clients used it. I did, and the acne was long gone after eight salon treatments and never returned. So I know for myself that aha acids can be very powerful and helpful. That said, it´s for most skins, but have a chat with a professional who can guide you to the right products within the range. Today my skin is more dry and sensitive than in my twenties, but aha is still doing its' wonders for this skin type as well. 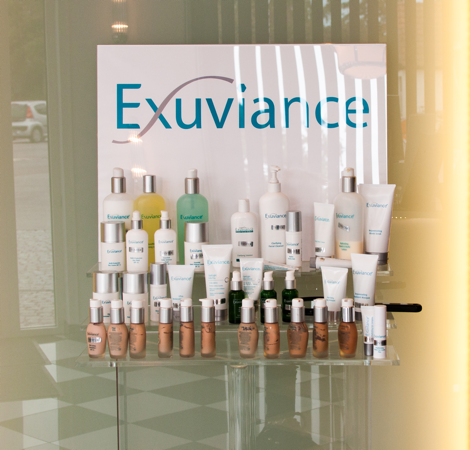 I had the Exuviance Deluxe facial which is said to be anti-ageing, highly moisturizing and benefit glow and cell renewal. The treatment was all of this and I could tell that my skin got what it needed. And afterwards I got a kit with products adjusted to my needs to complete the process at home. 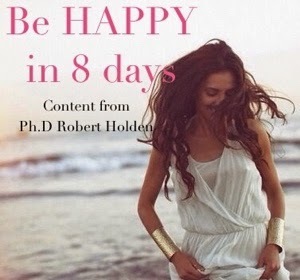 This two step process is something that I really like, so this is not just a single treatment. 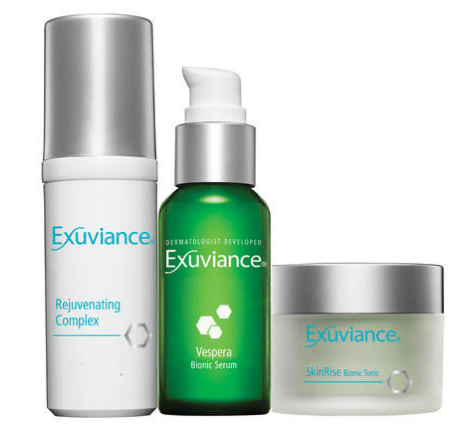 Exuviance is a medical skincare brand with 40 years of research and awards for their groundbreaking medical aha technology. Also on the plus side are the great prices for both products and salon treatments, they won´t kill your beauty budget and give a high value for money. 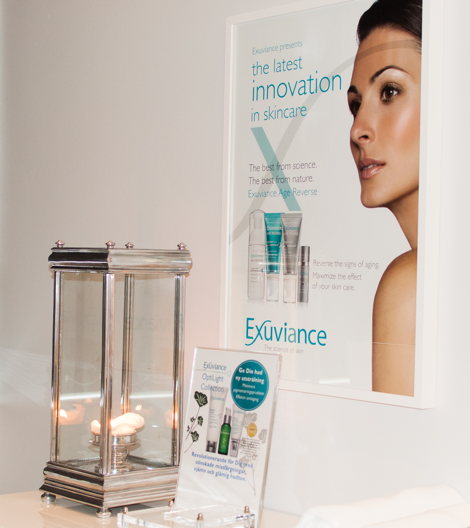 So if you want a facial that is a little more active and medical, then I recommend Exuviance. I know it´s what I look for in a facial treatment these days. Anti-ageing and glow. Well, this time you had me a hello. I love finding new brands, I use La Mer but these products sound fantastic!! I love to discover new brands. I'll look into this one, too. Thanks! Moreover, make sure that this certain facial salon sticks to the sanitary ordinances set by the ministry of health. The cleanliness of the equipment utilised in a facial salon is as critical as the treatment itself. Moreover, the offended party must demonstrate the aftereffects of restorative carelessness, for instance, damage or demise. At the end of the day, the customer ought to give the attorney all the important points of interest. A short time later, the legal advisor will continue with the essential techniques.